Cardiac Muscle:<$> N. Sperelakis,<$> Regulation of the Calcium Slow Channels of Heart by Cyclic Nucleotides and Effects of Ischemia. P.F. Wouters, H. Van Aken, M. Van de Velde, M.A.E. Marcus, and W. Flameng,<$> Functional Adaptation to Myocardial Ischemia: Interaction with Volatile Anesthetics in Chronically Instrumented Dogs. D.F. Stowe,<$> ExcitationContraction Uncoupling and Vasodilators for Long-Term Cold Preservation of Isolated Hearts. H. Machler, H.Gombotz, K. Sabin, and H. Metzler,<$> Troponin T as a Marker of Perioperative Myocardial Cell Damage. A.G. Hedman,<$> Silent Myocardial Ischemia: Pathophysiology and Perioperative Management. B. Drenger, Y. Ginosar, and Y. Gozal,<$> Effect of Halothane on Sarcolemmal Calcium Channels during Myocardial Ischemia and Reperfusion. D.M. Van Winkle, G.L. Chien, and R.F. Davis,<$> Myocardial Ischemic Preconditioning. P.R. Knight, M.D. Smith, and B.A. Davidson,<$> Effects of Hypoxia/Reoxygenation on Intracellular Calcium Ion Homeostasis in Ventricular Myocytes during Halothane Exposure. P.S. Pagel and D.C. Warltier,<$> Mechanical Consequences of Calcium Channel Modulation during Volatile Anesthetic-Induced Left Ventricular Systolic and Diastolic Dysfunction. N. Miao, M.J. Frazer, and C. Lynch, III,<$> Anesthetic Actions on Calcium Uptake and Calcium-Dependent Adenosine Triphosphatase Activity of Cardiac Sarcoplasmic Reticulum. L.A. Turner, S. Vodanovic, and Z.J. Bosnjak,<$> Interaction of Anesthetics and Catecholamines on Conduction in the Canine HisPurkinje System. J.L. Atlee, III, M.N. Vicenzi, H.J. Woehlck, and Z.J. Bosnjak,<$> Anesthetics, Catecholamines, and Ouabain on Automaticity of Primary and Secondary Pacemakers. T.J.J.Blanck, D.L. Lee, S. Yasukochi, C. Hollmann, and J. Zhang,<$> The Role of L-Type Voltage-Dependent Calcium Channels in Anesthetic Depression of Contractility. H. Komai and B.F. Rusy,<$> Effects of Inhibition of Transsarcolemmal Calcium Influx on Content and Releasability of Calcium Stored in Sarcoplasmic Reticulum of Intact Myocardium. I. Ueda and J.-S. Chiou,<$> Arrhythmogenic Effect of Inhalation Anesthetics: Biochemical Heterogeneity between Conduction and Contractile Systems and Protein Unfolding. Coronary Circulation:<$> N. Buljubasic, J. Marijic, and Z.J. 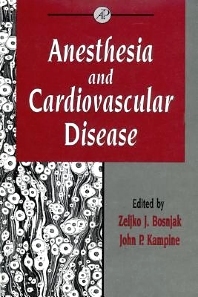 Bosnjak,<$> Potassium Channel Current and Coronary Vasodilatation by Volatile Anesthetics. D.R. Larach, H.G. Schuler, K.A. Zangari, and R.L. McCann,<$> Potassium Channel Opening andCoronary Vasodilation by Halothane. J.R. Kersten, J.C. Hartman, P.S. Pagel, and D.C. Warltier,<$> Volatile Anesthetics and Coronary Collateral Circulation. G.J. Crystal,<$> Myocardial Oxygen Supply(Demand Relations during Isovolemic Hemodilution. Cellular Targets:<$> D. Kosk-Kosicka,<$> Plasma Membrane Ca<+>2+<$>-ATPase as a Target for Volatile Anesthetics. J.E. Fletcher and V.E. Welter,<$> Enhancement of Halothane Action at the Ryanodine Receptor by Unsaturated Fatty Acids. D.A. Schwinn,<$> Adrenergic Receptors: Unique Localization in Human Tissues. A.S. Evers and M.D. Hossain,<$> Volatile Anesthetic Effects on Inositol Triphosphate-Gated Intracellular Calcium Stores in GH3<$> Cells. Reflex Regulation:<$> J.L. Seagard,<$> Differential Control of Blood Pressure by Two Subtypes of Carotid Baroreceptors. T.J. Ebert and M. Muzi,<$> Sympathetic Activation with Desflurane in Humans. M. Muzi and T.J. Ebert,<$> Randomized, Prospective Comparison of Halothane, Isoflurane, and Enflurane on Baroreflex Control of Heart Rate in Humans. L.B. Bell,<$> Baroreflex Modulation by Isoflurane Anesthesia in Normotensive and Chronically Hypertensive Rabbits. Peripheral Circulation:<$> T.A. Stekiel, L.B. Bell, Z.J. Bosnjak, and J.P.Kampine,<$> Effects of Isoflurane on Regulation of Capacitance Vessels under Normotensive and Chronically Hypertensive Conditions. J.B. McCallum, T.A. Stekiel, A. Stadnicka, Z.J. Bosnjak, and J.P. Kampine,<$> Effect of Volatile Anesthetics on Baroreflex Control of Mesenteric Venous Capacitance. M. Wood,<$> Effect of General Anesthesia on Modulation of Sympathetic Nervous System Function. M. Jeng, J.L. Hart, S. Bina, and S.M. Muldoon,<$> Inhibition of Nitric Oxide-Dependent Vasodilation by Halogenated Anesthetics. Q.H. Hogan, A. Stadnicka, and J.P. Kampine,<$> Effects of Epidural Anesthesia on Splanchnic Capacitance. P.A. Murray,<$> Anesthetic Modulation of Pulmonary Vascular Regulation. R. Dueck,<$> Pulmonary Mechanics Changes Associatedwith Cardiac Surgery. W.M. Zapol and W.E. Hurford,<$> Inhaled Nitric Oxide in Adult Respiratory Distress Syndrome and Other Lung Diseases. D.L. Roerig, S.B. Ahlf, C.A. Dawson, J.H. Linehan, and J.P. Kampine,<$> First Pass Uptake in the Human Lung of Drugs Used during Anesthesia. Y. Huang, J.B. Yee, W.-H. Yip, and K.C. Wong,<$> Lactic Acidosis and pH on the Cardiovascular System. Cerebral Circulation:<$> L.E. Moore and R.J. Traystman,<$> Role of Oxygen Free Radicals and Lipid Peroxidation in Cerebral Reperfusion Injury. A. Hudetz, J.G. Lee, J.J. Smith, Z.J. Bosnjak, and J.P. Kampine,<$> Effects of Volatile Anesthetics on Cerebrocortical Laser Doppler Flow: Hyperemia, Autoregulation, Carbon Dioxide Response, Flow Oscillations, and Role ofNitric Oxide. M.M. Todd,<$> Cerebral Blood Flow during Isovolemic Hemodilution: Mechanistic Observations. B. Hindman,<$> Cerebral Physiology during Cardiopulmonary Bypass: Pulsatile versus Nonpulsatile Flow. W.T. Schmeling and N.E. Farber,<$> Anesthetic Actions of Cardiovascular Control Mechanisms in the Central Nervous System. Subject Index. Contents of Previous Volumes.